Gulzar Mahal was built in the time of Nawab Sadiq Muhammad Khan IV. Its beautiful architecture contains European influences just like Noor Mahal. 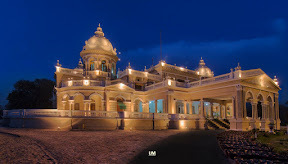 Interestingly the Mahal was the first building in Bahawalpur to be equipped with concealed electric wiring, and the system operated using a diesel generator. The Mahal presents beautiful synthesis of traditional and Islamic architecture and it is worth paying a visit. April 15, 2016, 9:35 p.m.